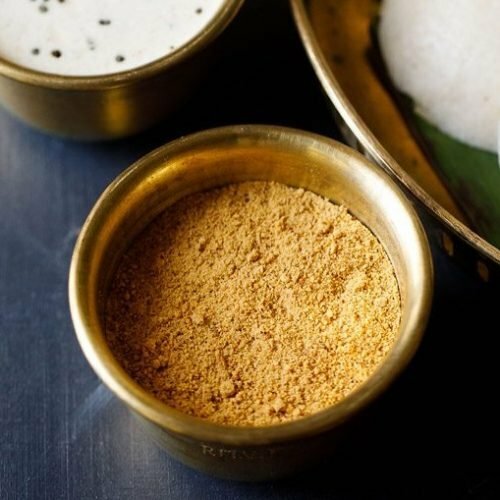 idli podi is condiment of spiced dry powder made with lentils and red chilies. idli podi is served with idli or dosa. idli podi is also known as milagai podi. keep all the spices and lentils ready before you begin. take a heavy kadai or a pan and heat it. keep the flame to a low. add ¼ cup urad dal to the pan. keep on stirring often while roasting urad dal. roast till the urad dal becomes golden and you get a nice aroma of the roasted urad dal. remove the roasted urad dal in a separate plate. then add ¼ cup chana dal to the same pan. keep on stirring often, while roasting chana dal. chana dal takes longer to roast. the chana dal should get browned or golden. for uniform cooking and color, keep on stirring them often. remove aside in the same plate. now take 2 tablespoons sesame seeds in the same pan. stirring often roast till the sesame seeds change color and start popping. keep them aside. in the same pan add ½ teaspoon oil. you can use sesame oil (gingelly oil which is made from raw sesame seeds). add 4 to 5 dry red chilies. remove the crown from the red chilies, before roasting them. break or halve the chilies and remove the seeds before roasting them. mix the red chilies with oil and roast them on lowest flame. roast the red chilies, stirring them till they change color and you can get their pungent smoky aroma. add 22 to 24 curry leaves (2 sprigs) in the pan. stirring non stop, fry for a few seconds till the curry leaves become crisp. switch off flame and add ½ teaspoon hing (asafoetida). mix well. then add 1 teaspoon salt. mix again. take this spice mixture in the same plate. let all the roasted spices cool down and come at room temperature. in a grinder jar, add the entire roasted spice mixture. grind in intervals of some seconds to a coarse or fine powder. do not grind at a stretch as then the sesame seeds will release oil. i usually grind it to a fine consistency as thats how we prefer idli podi. check the taste and add some more salt if required. then spoon idli podi in a jar. close tightly with a lid and keep milagai podi at room temperature. you can even keep in the fridge. for 1 serving, take 2 to 3 tablespoons of idli podi. mix it with a bit of sesame oil or ghee. serve with idli, dosa or uttapam.